Many, many years ago, when I was a fulltime worker and children weren’t even on my horizon, a colleague named his baby Alex. K. Smith. What’s the ‘K’ stand for, we wondered. I was surprised to discover that the ‘K’ stood for nothing – it was included simply to provide Alex Smith some differentiation in the virtual world, if needed. At the time, this seemed simply bizarre. Fourteen years on, however, it showed foresight. Today’s new parents can go one step further with Babysquatter. 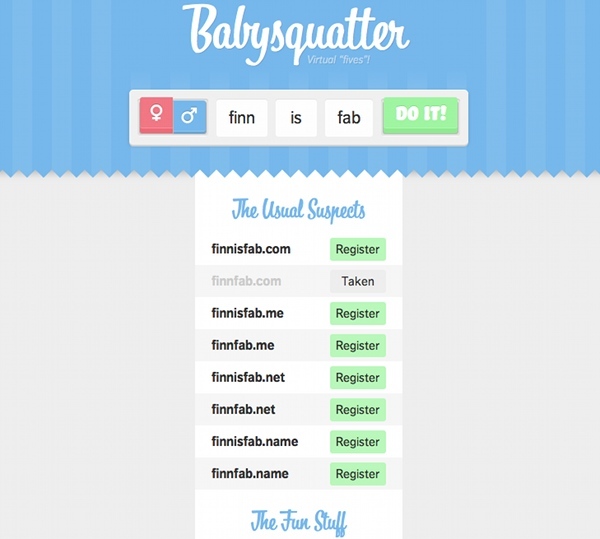 Created by Ian Storm Taylor, Babysquatter is a tongue-in-cheek but fully functional domain name search engine. Taylor came up with Babysquatter figuring that we don’t know what will be de rigueur in 2025 – maybe everyone will have their own website? 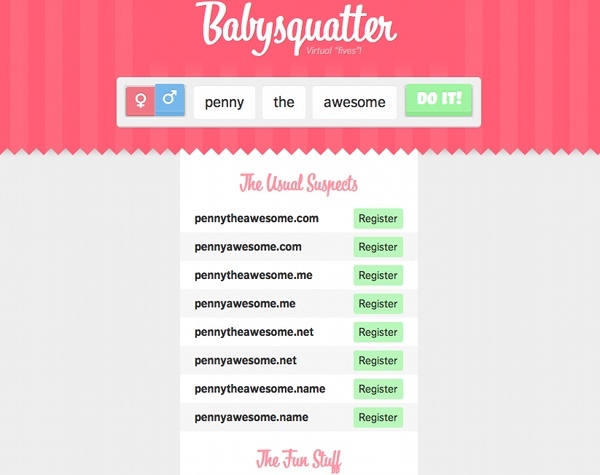 So perhaps I should grab PennytheAwesome.com for my daughter now so that she’s not left with PennytheDregs.com in 2025?! Still searching for the perfect baby name? Find inspiration here, here, here and here.